The industry’s first modular RF scanning receiver Nemo FSR1 is a revolutionary solution that evolves as the wireless technology evolves. Our design separates the RF from the signal processing by utilizing field replaceable RF down converters. When a new band or band combination is needed, simply install a second down converter. When it’s time for calibration, use a spare down converter and keep your scanner in service with zero down time. When a new technology is adopted, the scanner is ready with a simple flash to add support for that technology: the most cost-effective scanning solution you can buy. 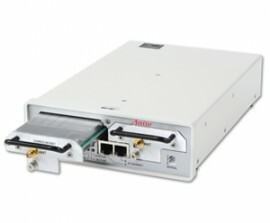 It supports measurements on LTE, MIMO, WCDMA, HSDPA, GSM, CDMA, and EVDO networks. Unique plug-in RF down converters make the scanner field-upgradeable, dramatically reducing service turnaround times, boosting productivity, and cutting total cost of ownership. • Features two plug-in modular RF down converters available in many frequency band configurations. • Support for up to eight bands in a single receiver. Supports LTE, MIMO, WCDMA, HSDPA, GSM, CDMA, and EVDO. • Field upgradeable design enables the easy adding of additional bands and technologies. • Compact size and low power consumption (50W maximum).